The 100 µm scale bar applies to la, 2, 3 and 4a; figs. 1b, 1c and 4b have their own (10 µm) scale bar. Figs. 1-4. Hexastylus solonis. Fig. la: (nearly) complete specimen with, partially visible through the cortical shell, the five fibrils (four complete, the fifth broken) of the medullary shell (fig. 1c). Figs. 1b and 4b: Detail of the macrospheric shell wall, with polygonal frames, subround pores, and knobs/by-spines. Note three-bladed (fig. 1b) vs. cylindrical (fig. 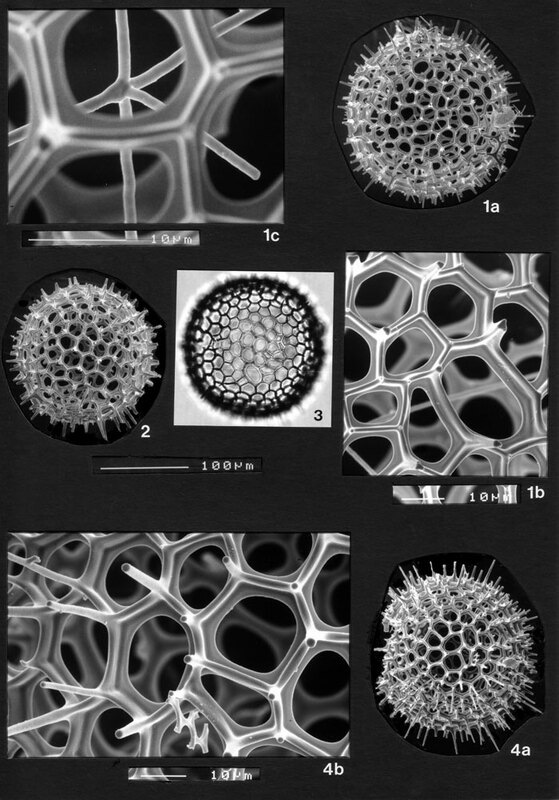 4b) nature of these spines. Each nodal point bears either a by-spine or a knob. Figs. 2, 3: specimens lacking microsphere. BSS 28B(IX/1256). BSS 28B(IX/1299) and BSS 19B(F) EF C55. BSS 28B(IX/1242).